"Face it Morneau, you're not your own master . . . The spirits own you in your entirety . . . One thing in particular, the high priest wants yo to realize - no one has ever gotten out of your secret society alive . . ."
The experiences and questions of childhood and wartime had turned Roger Morneau away from God. After the war, a friend led Morneau into demon worship, but Morneau discovered the good news of a loving God and wanted out. 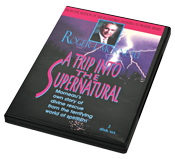 In this gripping two-part DVD series, Morneau relates his dramatic exprience and deliverance from a secret world of deception.